1. Let your five-year-old budding Da Vinci create a masterpiece with some paint and your old toothbrush. 2. Scrub oily areas on your face with your toothbrush. The bristles are perfect for removing embedded dirt and oil that clogs pores. 3. Pamper your hamster by brushing his fur with an old toothbrush. 4. Dab a bit of Vaseline on the bristles and comb your eyelashes: instant glamour! Got dry, flaky lips? Slough away by using a toothbrush on your lips. 5. Remove the bristles: instant small plant stakes! 6. Old toothbrushes are great for spot-cleaning just about anything. 7. When nobody is around to scratch an unreachable itch on your back, turn that old toothbrush into your personal backscratcher. 8. Is your dog’s breath so bad that all your houseplants have died? 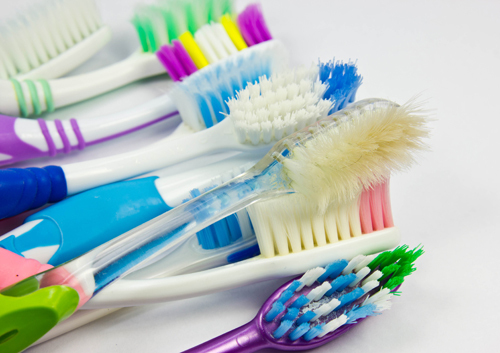 Try brushing his teeth with your old toothbrush so that his kisses (and breath) are more tolerable. 9. Give your fish the cleanest tank in the neighborhood by scrubbing it with your old toothbrush. 10. Did you notice a few gray hairs sprouting from your hairline this morning? Old toothbrushes were made for touch-up dye jobs; works for dyeing your eyebrows, too!